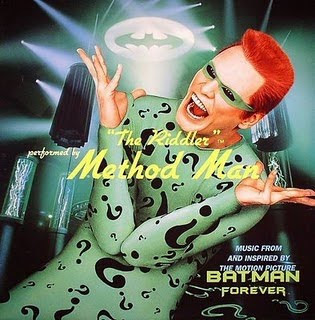 Hip Hop and Breakz: random nineties 12" number 9-Method Man - The Riddler 12"
random nineties 12" number 9-Method Man - The Riddler 12"
For the 9th part of my random 90s 12" series I have chosen an often overlooked Method Man 12" from 1995. This is a pretty dope 12" featuring Mr Meth over a couple of disjointed Rza beats but more importantly this 12" marks a turning point in Method Man's lyrical style. Prior to the release of this 12" Method Man's flow was more fluent and of a higher tempo. You could often hear Meth on 36 Chambers and Tical having to take breathes in between hectic bars. It was almost as if he had too much too say and was struggling to take breathes in between these lines. He sounded hungry, trying to prove himself over the other members of the crowd. Remember for a lot of people Meth was the first member of the Clan they ever heard. An example of this style can be found on the original version of Meth Vs chef where Meth wrecks the track "for Dolo", check the link below. This was a nice change at the time because we had been flooded with Meth and the whole Wu for 18months to two years prior to this. But as the years and the albums went on this style, to me at least became somewhat boring compared to the charismatic hungry flow of his early work. It was almost as though a conscious decision was made to relax the flow, that they had made it and an element of the hunger was gone. Don't get me wrong Meth is still an emcee I enjoy a great deal and like more than most rappers he has a charismatic character that draws you into a song. However I remember what the old, or should I say young Meth rapped like and it would be good to hear that again. For the record this 12" was bought in the Legendary Deal real probably form my man MK or Pete for the pricey sum of £6.00. Check the link for the vinyl rip including the instrumental and also the original version of Meth Vs Chef.